White fillings are one of several types of tooth fillings offered at Park Place Dental Practice, Cardiff and can greatly improve your dental appearance. Fillings are used to replace broken or decayed teeth when the amount of damage is small. Unsightly amalgam fillings can be replaced with more advanced cosmetic fillings. 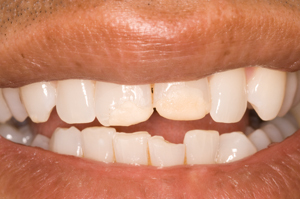 The latest cosmetic, composite fillings can restore a tooth to its natural state as shown below when a patient accidentally broke their perfect front teeth. They have been restored to their original appearance without any further damage. Our experienced team can advise you as to the most suitable filling material to ensure the correct combination of beauty and strength is achieved. When a direct filling is not suitable a crown or cosmetic inlay may be more suitable. We will advise you according to your individual need. 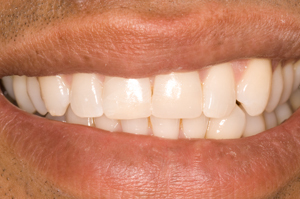 For examples of our past cases please visit our smile gallery.